It’s not the best time to be a student. The sun might be shining outside but the gloomy cloud of exam period is gathering ominously overhead. The Marketplace has run out of overpriced sandwiches and it’s easier to find the Holy Grail than a seat in the library. First world problems don’t get any more serious than this. Life, as they say, is not fair. But Hijacked Festival has come to the rescue of those stranded in the dark doldrums of Library -1. Exeter’s premier summer music event has released its full line up, and we’re already getting giddy with excitement about the artists gracing the grounds of Powderham Castle next month. It’s a refined, crowd-pleasing bill replete with an eclectic mix of big hitting headliners and local talent. So take a revision break and allow us to give you a rundown of all the new acts ready to provide the soundtrack to your post-exam calendar. Arguably the biggest name in the announcement is the English Hip Hop heavy weight Niomi Arleen McLean-Daley, better known as Miss Dynamite. Having collaborated with more artists then we could possibly cover, her back catalogue reads like a hall of fame in underground music. The decorated London-based artist is the recipient of The Mercury Prize, two BRIT Awards and three MOBO Awards and is best known for the bangers “BOOOO” and, of course, the eponymous slow jam “Dy-Na-Mi-Tee.” We will be at the barrier for this set and are in no doubt that the queen of all things R&B will rule over a hedonistic party atmosphere. If Miss Dynamite is undisputed royalty in the R&B game, then Madam X is the newly crowned Queen of the grime scene. After leaving her hometown Milton Keynes for Manchester a few years ago, she has established herself as a vital force in the city’s grime and bass movement. After launching her music label Big People Music, the Fallowfield-based artist has taken her record bag around the UK and beyond, as well as nabbing stints on local stations and Radio 1Xtra. Her underground sound taps into Manchester’s burgeoning bass obsession, with her sets regularly featuring tracks from Sudanim, Samrai and Murco alongside other cutting-edge grime producers. Known for her swift, choppy mixing technique and a penchant for dark, grimy sounds, Madam X will put on one helluva party. Next up is Bok Bok, the South London DJ famed for his hard-hitting percussive workouts that always put an inventive spin on lo-fi house, techno and grime. Bok Bok delivers serious out and out anthems, with each set providing a fresh take on current trends. Given the resurgence of Grime’s new wave, we expect to hear plenty of garage-based 4×4 breakbeats. The DJ also co-runs his own label Night Slugs with head honcho L-Vis 1990. The duo have been a leading outlet for fresh music mutations for over five years now, so we also anticipate strong dose of minimal techno and future-facing R&B thrown in for good measure. In all, Bok Bok promises to deliver a diverse, unpredictable and dynamic set guaranteed to pack a nice surprise for dance music newbies and veterans alike. They say that two minds are better than one. Well, it turns out that two DJs are better than one too. Step forward identical twin DJ duo Eniz and Deniz, AKA The Mendenez Brothers. This West London-based act is well known for throwing down some of the most fun and enjoyable sets in the land. Always committed to showcasing their diverse music taste, the brothers are equally comfortable playing House and Bass as they are UK Garage or classic Hip Hop. Expect nothing but positive vibes when these DJ’s come to a dance. Finally, we have ACT COOL, consisting of producers David Coleman & Ashley Hamilton, who are following on from the success they enjoyed under previous alias’s, including performances at Bestival 2013, Global Gathering & Beach-break Live as well as airplay from Zane Lowe. The South London duo has recently started to collaborate producing forward thinking dance music. Their sets often feature chunky beats and analogue bass lines mixed in with some urban flair, so put on your dancing shoes and get ready to groove. But where will these acts be playing? With such big names descending on our little city it’s important not to forget the homegrown talent performing alongside these internationally renowned names. To compliment the big hitters, an impressive array of local talent and student residents will add an eclectic layer of underground beats. Familiar student DJs Josh Toogood and former Hold it Down resident and Our House regular Kian Rayment form the crest of a wave of talent emerging from the dark depths of Cavern, bringing their slick beats and gritty bass to the glorious open air of Powderham castle. 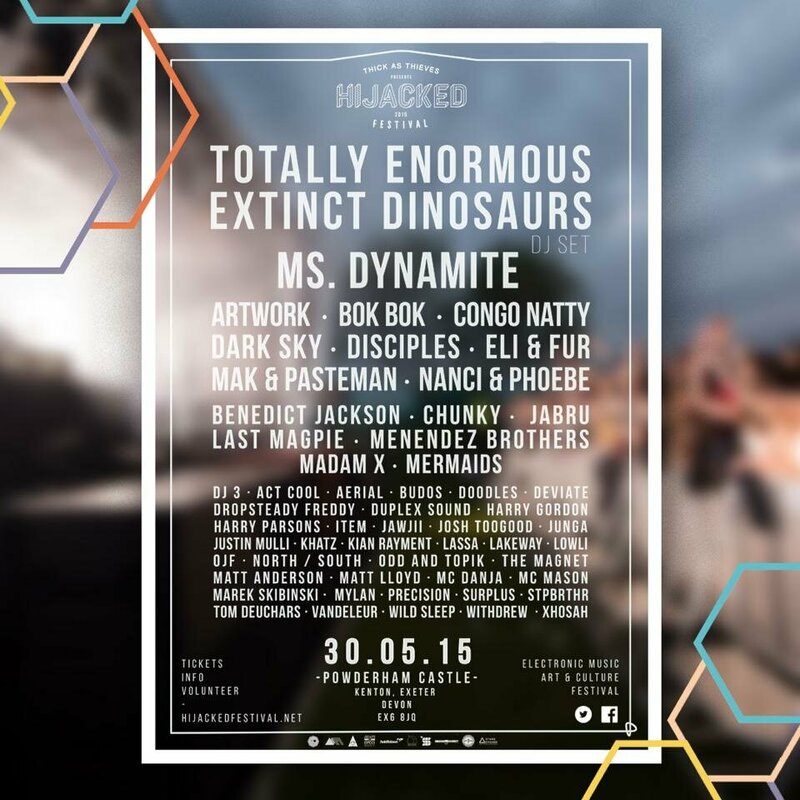 These acts attest to this region’s burgeoning dance music culture, with Hijacked providing the perfect stage for home-bred DJs to showcase their expansive talents. And if that’s not enough, the Hijacked team are also promising a full visual experience at the site with the stage décor being stepped up considerably from last year. The different stages will be accompanied with opulent visuals to offer an exciting on-site experience that meanders through all different sub genres of electronic dance music. The Main Stage will play host to the widest variety of genres and no doubt this will be reflected in the huge crowd that will be there throughout the day. The Aquarium will be much more focused on all things House, Techno and UK bass and will play host to a crowd of discerning heads in this sub aqua setting. The underwater orientated theme of this stage will transform an inside venue into a subversive escape, allowing you to get lost in the deep dark depths of music. Finally, not forgetting the Jungle Stage that will pump out strictly Jungle, Drum and Bass and Reggae and Dub all day and all night. This stage is going to supply all sorts of fun and we definitely expect to find some of the most raucous party goers here. With the countdown under way, it’s time to get excited.